No costume. No props. No excuses. When I re-booted my writing career six years ago my goal was to get regular gigs and earn a passive self-sustaining income from writing. My writing income isn’t even passive-aggressive. Oh, I have an income but it’s hardly enough to cover webhost fees let alone pay a mortgage. Or buy dog food. But I’ve kept at it and I’ve also kept my day job. Since 2012 I’ve read my stories on the air (thanks NorthState Public Radio) and gotten gigs with several magazines (thanks American Whitewater Magazine, Central Valley Business Times, Chico Enterprise Record, Chico News and Review, Growing Up Chico, Hockey Player Magazine) and have been featured in several blogs ranging from Dad of Divas (Michigan) to Smiles for All (New York). My book “Let Me Tell You a Story” ranks in the top 1.7 million in sales on Amazon. I continue churning out work and running the Etc. Guy blog with a gerbil powered budget, augmented by revenue earned by selling aluminum cans, blood plasma and two books per year. It’s still fun so I’ll still do it. Six months ago I submitted several stories to the Blue Room Theatre Group in Chico (California)—an invitation to North State Writers—to be performed live. My story “Hockey Mom’s Excuse Scores Hat Trick” made the cut. So now I’m going live, as in “playwright live.” Cool beans. 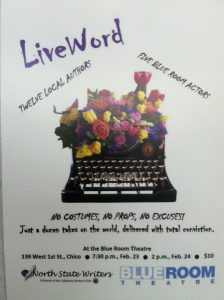 Join me and other fun-hogs later this month at the Blue Room Theatre in Chico as we watch unflappable actors perform the work of North State Writers. Tickets are $10 each. Performances will be held February 23, 2019 at 7:30 PM and February 24, 2019 at 2:30 PM. I’m curious to see how my work pans out on stage. Maybe it will lead to other venues. We’ll see, we’ll see. I’m fine with starting small. Small is good. Better to choke in Chico than bomb on Broadway. For ticket information visit Blue Room Theatre. Thanks for reading. And thanks for watching. PS Vist the Etc. Guy Facebook page too and LIKE it. 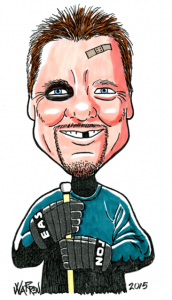 This entry was posted in Community, The Humor Project and tagged arts and leisure, community theater, hockey humor, humor writing, live performance. Bookmark the permalink.